These aren't just glossy white 3DS units. They are, for Metal Gear fans, two of the coolest pieces of merchandise they will ever lay their eyes upon. 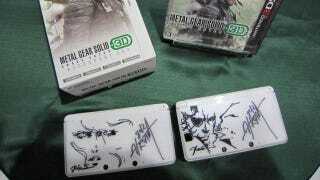 Those sketches were drawn directly onto the handhelds by long-time series artist Yoji Shinkawa. The signature on the right? It's the John Hancock of series creator and boss Hideo Kojima.